Market Street in San Francisco, a protected bike lane built in defiance of the state’s former refusal to endorse such facilities. Four months after a scorching external report called on California’s transportation department to change its ways, that’s exactly what seems to be happening. In an announcement Thursday night reported on Twitter by the National Association of City Transportation Officials and on Facebook by Fremont Public Works Director Bryan Jones, the head of the country’s largest highway department said his agency will officially endorse NACTO’s street design guide, a document that tracks the best practices for adding protected bike lanes and other human-oriented infrastructure to U.S. streets. “This is the culmination of three years of a long and targeted campaign of ours and we’re pretty psyched,” said Dave Snyder, executive director of the California Bicycle Coalition. 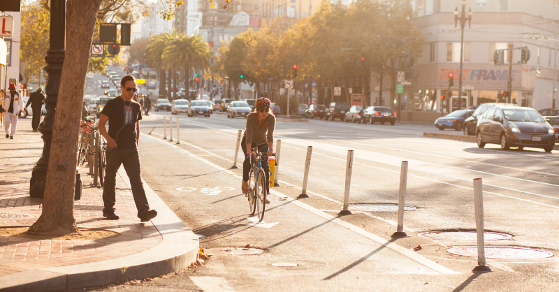 The fact that the nation’s largest state will be the third (after Washington and Massachusetts) to officially endorse NACTO’s Urban Street Design Guide is a major victory for biking and walking infrastruture advocates in California. It’s likely to assure hundreds of small and mid-size Californian cities that they won’t face extra liability if they install properly designed protected bike lanes. Caltrans Director Malcolm Dougherty’s announcement Thursday shows that might be changing. The NACTO endorsement was one of four “immediate” actions recommended by a January report from the State Smart Transportation Initiative that had been commissioned by Gov. Jerry Brown. Brown, who promoted Doughterty in 2012 from deputy director of Caltrans, has sided generally with Caltrans reformers but effected few top-level changes in agency practice until now. Also Thursday, Caltrans circulated a two-page memo from its chief designer that explicitly endorses the NACTO guide as a useful resource for safe street design. Snyder, the statewide biking advocate, wrote in an email Friday that his group had been asked for input on Craggs’ memo. Co, the Oakland-based transportation planner, said last year that because bicycle riders and advocates are pushing for protected bike lanes in so many communities, he feels Caltrans’ role should be to endorse guides like NACTO’s that show how to make such facilities safe and comfortable.